TheFoxAddict's try at Furry art and Fursonas - traditional and digital artwork - Furtopia | Family Friendly Furry Forum and IRC Chat! 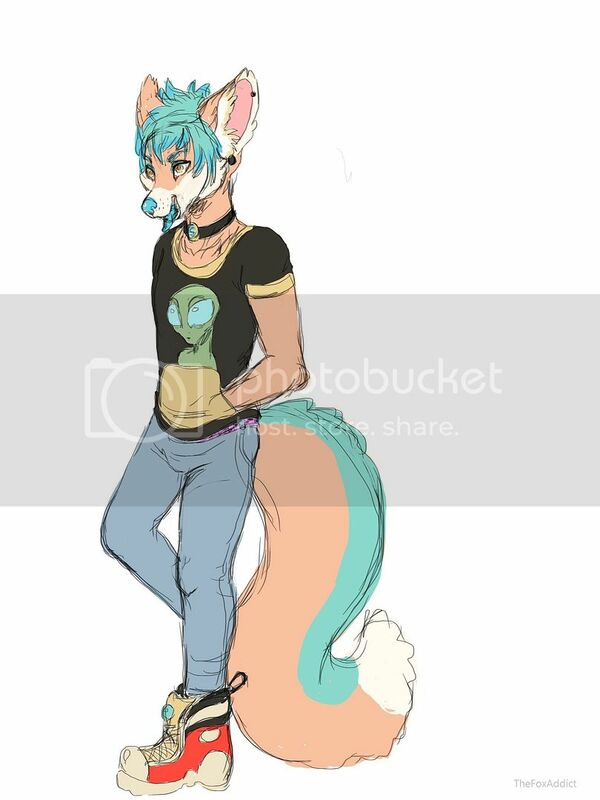 First a very messy color sketch of my fursona just to find out what design and which colors I want. I've been experimenting with his design forever. But I can finally say I've found out exactly how I want him! He's a red fox and fennec fox mix. I haven't found out his name yet. I hope he turned out ok... I'm not very confident with my drawings and always think I do worse than I probably do I have astigmatism and very bad eyesight. I guess maybe that is part of why I always doubt if I did a good job or not. Well, enough of that Since I'm such a Furry newbie, I hope it's ok if I ask a question? I'd really like to get a partial fursuit of my fursona oneday. I was wondering because I struggle with drawing, if this drawing would be enough to send as a reference to whoever that are going to make my fursuit? That drawing just by itself would not be enough reference to give to a fursuit maker in order to make a fursuit. Most fursuit makers tend to require a character sheet with side, front, and back profiles, plus maybe various views of the head, tail, handpaws, etc. Ok thanks. I still need to perfect my character before I do anything. But when I'm ready (if I feel brave enough to get a fursuit) I only wish to get the head, upper paws (hands) and the tail. I prefer my characters wearing clothes and shoes. Oh my gosh, this is beautiful! These are nice illustrations. Keep up the good work! I only sketch like this first to figure out how the character shall look and what colors I want. Final Fursona sketch in progress. 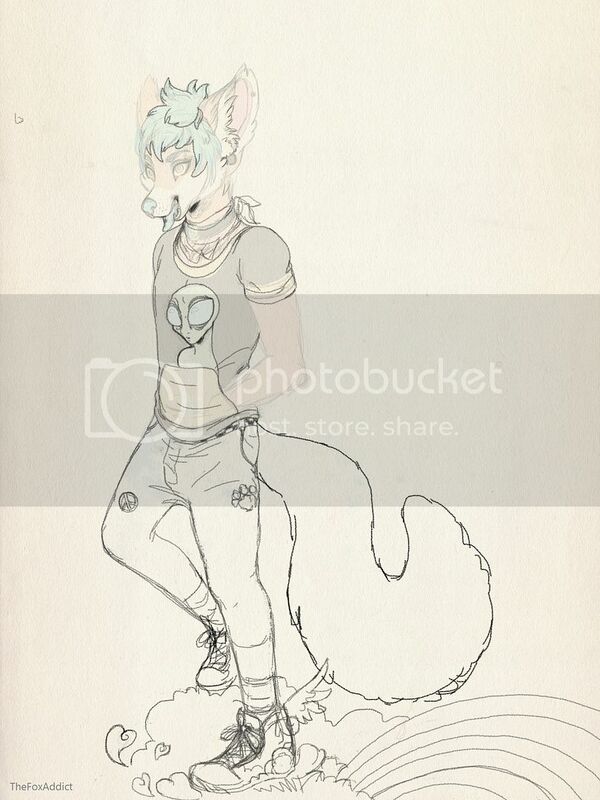 My psychedelic fox boy<3 You'll see the details better if you zoom in. I made him everything I am and wish to be. I'm a fox addict. The alien top stands for my sci-fi and little grey aliens love. The rainbow stands for the colorful person that I am, plus I love rainbows. The rainbow got noting to do with gay pride or the LGBT community. Rainbow colors is just my favorite colors. I want world peace. And I love Hippie and Bohemian fashion and music. EDITED POST AND PICTURE: I don't really like to bring it up. I don't want people to believe I'm doing it for the attention. But I feel like I always have to explain myself and apologize for my unfinished work. It's a bit uncomfortable for me to post my in progress drawings without an explanation. It's just that drawing takes me a very long time. I spoke of my astigmatism and very bad eyesight in my first post. It runs in the family. But I also have to deal with my Chronic Fatigue Syndrome diagnosis. I don't have much energy to spend on drawing. And sometimes I don't draw for weeks. We always enjoy seeing the drawings of our members. Even if we don't always comment on them. I love that fennec/hyena - great character design. Thanks Still so much to learn when it comes to drawing anthro characters.